Heavens know that we have a lot of funky beach bars in the British Virgin Islands(BVI), but there is always room for one more. 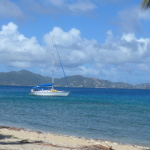 The most (in-)famous ones are Soggy Dollar, Foxy’s and the Willy T and you can find one or 2 in many other anchorages. So what is special about this one? 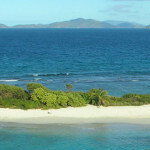 It is named the B-Line Beach Bar and perfectly placed on a small beach on Little Jost van Dyke. It is wonderfully unpretentious and basically just a shack. Here you will get sand between your toes, cold beer, good food and friendly service. In other words, all you need and want! 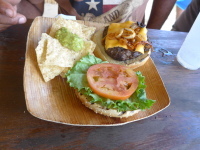 There is 5 dishes to choose from – all at $12 – and everything is served on plates made out of banana palm leaves. Of cause there are ice cold beers and if you can hit the bucket behind the bar with the beer top, you get it for free. There are also a couple of special concoctions and I can highly recommend the Ginger Bloodies, with tons of fresh ginger! All in all this a great place to hang out on a lazy afternoon in the Caribbean. 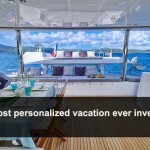 It can only be reached by boat, so charter a yacht from www.amazingcharters.com and cruise the BVI for your vacation. Swing by the B-Line try it yourself. . . and tell me what you think.